Whole Life Coaching is a unique coaching model. Do you want to feel focused, organized and engaged in your everyday life? Do you want less stress and more time for things you enjoy? Do you want more purpose and meaning in your life? Do you want to make a difference in your community and/or the world? Do you want to love your life? If you answered “yes,” to any of these questions, Whole Life Coaching might be just what you need! Life is hard. It has been, since the beginning of humankind. While we no longer have to hunt or gather our food, make our shoes ourselves out of animal hides and sleep on the ground, life is still hard. We work too much, often at jobs we hate. While our chances of being killed by a bear or dying from a toothache have dramatically decreased, we suffer from all sorts of modern-day ills – obesity, diabetes, auto-immune conditions, cancer. Even many of us without a diagnosed condition, feel somewhat crappy on a regular basis. Though we’re more connected and dialed in than ever, more people are lonely and depressed and anxious than ever. People are frustrated by what is happening in the world – the political climate, mass shootings, terrorism, racism, sexism. But have no idea what they can do about it. The mental affects the physical affects the emotional effects the spiritual. And vice versa. This is why health and life coaching really cannot be separated. You can’t live your best life, if you feel crummy in your body. You can’t have vibrant health if you are stressed and unhappy. You can’t save the world if you can’t pay the rent. You see what I mean? It’s all interconnected. In the Whole Life Coaching program, we take 9 months to create the life you want. We’ll put systems into place to help you reach your goals. And we’ll be doing it as a community, so you’ll have support from me and the rest of the group. You’ll be hanging out with others who are raising their vibrations, so yours will increase more easefully. In the first three months of the program, we focus primarily on the physical body. We’ll focus on Ayurvedic daily habits, with a 21st century twist. We’ll start to learn about habit-change science and tackle our persistent bad habits, while cultivating better habits. We’ll explore our relationships with food and find the best way for you, as an individual, to eat. Align – manage your time and finances and space. 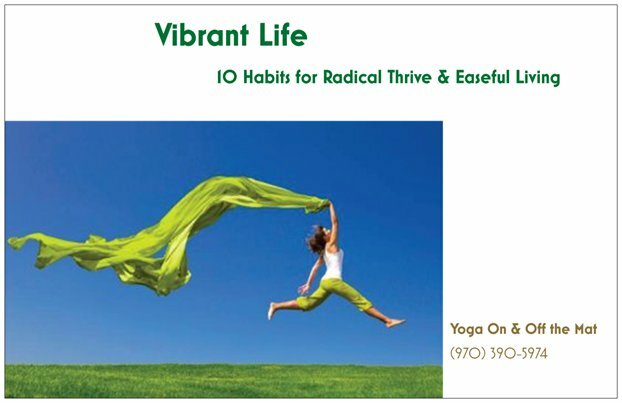 Once we’re vibrantly healthy (or on a trajectory to get there), we can start on the next steps. We likely still have other stressors. And they’re likely less tolerable now. We’ll examine how we currently make a living and how we feel about it. We’ll examine our financial situation, and more importantly, our relationship to our finances and how we can improve it. The Divine Feminine is on the rise! Whether you’re a woman or a man, you want to be part of it. We’ll explore how we can give back – to our loved ones, friends & community. We’ll delve into our dharma, or life’s purpose. Whether that’s figuring out what that might be, or putting it into action, we all have a purpose, probably many. How can we live it and be it? How can you live the life of your dreams and make a difference at the same time? (It’s easier than you think; you just have to get out of your own way). This is the pilot for this course, so the price will never be lower. Bring a friend – you both pay only $648! Payment plans, work-studies and even a few scholarships available. Contact me! Email alexbiondoyoga@gmail.com for more information and to schedule your free discovery session, to see if Whole Life Coaching is for you. There’s no obligation, you have nothing to lose, and even if you decide that the program isn’t for you, you’ll still get a lot out of the session.